A Week Ago I Couldn't Spell Chinandega, Nicaragua. I still can't without thinking hard about it, but I'll never forget being there. Having worked in, around, and through the Juvenile Justice System of Taylor County, Texas since 1978, I've seen more than my share of throw-away kids. (The definition, if you have not encountered the phenomenon is those who didn't really run away but were told to get out and don't come back.) 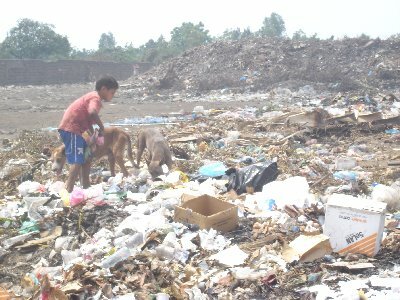 The trip to see Chinandega's Children of the Dump, though, took the concept to a whole new level. I was one of 29 Rotarians, most of us from District 5790, who flew from Houston to Managua on Thursday, March 3. Arriving after dark, it was hard to see much on the streets of Managua, though there were plenty of people standing around. There always are plenty of people standing around, it seems. I did see a park, or what looked like a park, covered with tented tarps and people seemingly at home for the night. We reached the Cesar's Hotel where we were staying and the machine-gun armed guard opened the gate. The hotel was a delightful place, rustic but air conditioned. My roommate, who I met for the first time in Houston, was Barbara Lewis from Breckenridge. Our room was large with two double beds. The massive furniture didn't particularly match, but each piece seemed sturdy and comfortable. The hand-quilted bed covers did march, though they were worn. The shower ran cold, or in that climate cool. The next morning we learned of a switch near the head, an electrical connection to be toggled without standing in water, that allowed the hot water to run. In addition to that problem, a plastic tube had come off and the water that should have been directed there flooded the bathroom, including the dirty clothes I'd left on the floor. The room would at least teach a person to pick up after herself! Breakfast included rice and beans, which would appear on almost every plate we were served in Nicaragua, eggs, sausage, fresh papaya, melons, pineapple, and watermelon, fried plantains, and pancakes. The orange juice seemed a bit watery but the coffee was fine. We watched as the suitcases and boxes were again hefted onto the top of the buses then left, getting only to the convenience store were we stocked a very large cooler with water, Cervesa Victoria, colas, and rum, all generously iced down. The convenience store had another machine-armed guard who directed traffic toward the out door when we attempted to exit the wrong way. Chinandega is 132 km from Managua, but you quickly learn the condition of the road in Nicaragua counts a whole lot more than the measurement of it. This was a decent road and, stopping in Leon for more provisions at another guarded convenience store, we made pretty good time. The delays came from slow-moving traffic on a busy two-lane road but also from waiting for Frank, our Nicaraguan-born Houston Rotarian guide/leader/guru, to finish visiting with friends old and new. I just checked, and there is a word for "hurry" in the Spanish language. There's just not such a concept in the mindset of the people around there insofar as I could observe it. The trash is burned at the dump after it dries out. From the time it falls from the dump-truck until it is burned, the people of the dump pick through it for salvageable pieces. At the time hurricane Mitch flooded the area and caused the San Cristobal volcano to collapse and cause a massive landslide, (October-November 1998) 2000 displaced people were taken to the dump by government authorities and told they would be relocated as soon as possible. Obviously, it never became possible. Already, before Hurricane Mitch, other families were dependent on the Dump for their existence. When Rotarians from the Houston area became involved 600 children still lived from the materials they found in the city dump, a number reduced by at least 200 from earlier efforts of Father Marco Dessy and others. I didn't count the people I saw at the dump. I would guess the number wasn't over 30, about half of them children and all of them filthy. Father Marco talked to some of them as he has done so often. Many have chosen a more promising life and have moved forward to hope. Others, encouraged to disbelief by Sandinistas and others, doubt the good intentions and real hope offered. The smoke from the burning trash burned eyes and obscured vision, but not enough. The picture implanted itself permanently in my psyche. From the Dump we went to a clinic for the children of the dump. There a dentist and a physician use antiquated equipment to meet the needs of 7000 people. 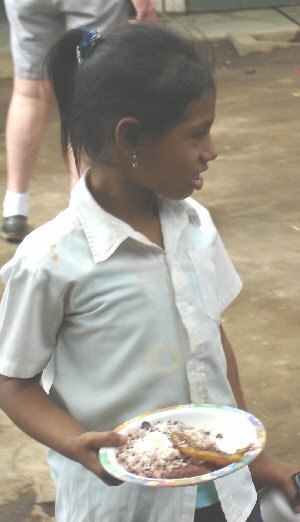 We walked a few yards to a school filled with happy children, many of them formerly inhabitants of the Dump. They absolutely glowed as they sat in class in their uniforms, soaking in the education being offered. Many of their mothers had found employment preparing food for them, and from the youngest classes to the oldest, the children eagerly stood in line with their dishes waiting for food to be ladled in. (Rice and beans, of course!) At this point the school has elementary, middle, and high schools grouped together. An additional building to use for a cafeteria was constructed a year ago, but the growth of the student population has placed classrooms there. One group of students come in the morning, leaving at noon to be replaced by others. A new school is planned across the street on what is now an athletic field. They had funds to build the elementary and middle schools but lacked $30,000 for the high school. Our group brought that much with us and made an executive decision among those there to donate the bulk of the money we brought for finishing the high school. It was, in our opinion, the better of two options we had available, neither of which were exactly what we envisioned when raising the money. It does, however, accomplish the real goal of benefiting the children formerly of the dump. Lunch prepared by students at Betania Trade School was delicious and welcome. After the respite, we moved on to Refugio Belen, a maternity refuge. 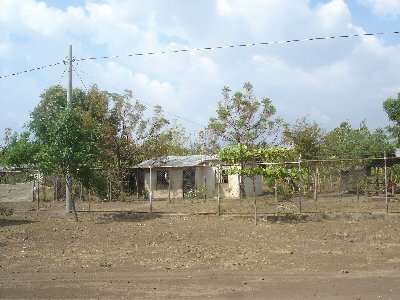 Women come from a wide area to be near the single hospital in Chinandega. They have one ambulance serving the entire population of something close to 100,000. The women, who must be in good health to come, spend the end of their pregnancy there and can stay a few days after the child is born. They are taught child care and other useful information besides being able to have the child in the hospital with good care for themselves and their babies. The house, once the home of a wealthy family, became a Gestapo-type place of horror under the Sandinistas. The roomy, comfortable refuge now, though, fulfills the will of God and, Father Marco believes, erases the bad acts that came before in that house. What once was a tennis court soon will be additional rooms to serve more mothers from 11 years old through their late 40's. We returned to Betania for the third time, this time to see more than the office building where our luggage was stored and the assembly area where we had eaten lunch. 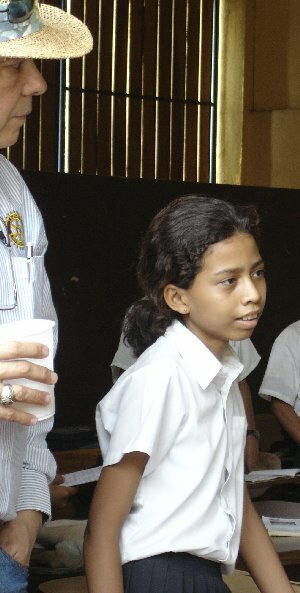 Children selected for the program show outstanding leadership potential and excel in school. The program has been for several years in middle school and early high school but will be expanded to an eight year program in the next few years. Children learn normal educational lessons and leadership skills half the day then a trade the other half. Trades include sewing, cooking, canning and storage of food, woodwork, pottery, metal work, and music. The Getsemani Boy's Choir from the school has acted as an ambassador raising funds and awareness of the needs of the Chinandega children in Europe and the Americas. Adjoining Betania is Santa Lucia school for the blind. There we witnessed blind children weaving baskets and hammocks. In answer to the question, "How do you know when to change colors?" we learned the strands are premeasured and when the string is finished, the weaver asked a sighted person for a recommendation for the next color. After a full day, it was good to pass through the guarded gates of the Los Volcanoes Hotel. After a refreshing shower with hot and cold faucets--and hot and cold water--we moved to the bar to await dinner with Rotarians from the Chinandega club. A special treat was also to have Rotarians from Tulsa, Oklahoma, and from Pittsburgh, Pennsylvania, join us. We gave mounds of school supplies, clothing, candy, toys, and other gifts to Father Marco for distribution among his projects. The next morning our group divided into two, one working hands-on to build a structure, the rest of us touring San Matilde and San Pablo. San Pablo at this point is a field with the stubble of a peanut crop. Within a year, it will be a community of micro-farms and residences for some delightful people we met near there. Although it was Saturday, the school children came in uniform and sang for us and their proud parents. The school was in an emergency shelter, one of the few permanent buildings in the area. 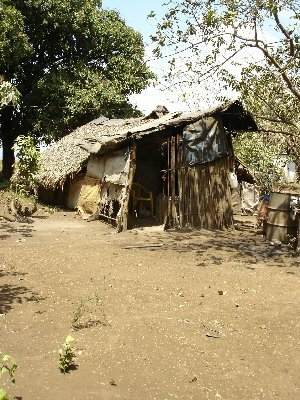 The housing where squatters shacks where they made a life as well as they could. A long way from Chinandega, at least considering the state of the poor road there, the people survive on the fruits that grow and the gleanings from peanut crops in the area. On the other side of Chinandega and after another great lunch at Betania, we found San Pablo, a community of 333 houses and micro-farms built by and with help from the Chinandega 2001 Foundation, Rotary Clubs, Food for the Poor, Amigos for Christ, Doctors without Borders, the Nicaraguan Health Department, the Red Cross, USAid, and the Betania choir Coro Getsemani. There houses, fenced, offered floored residences with water and electricity. Each house has a third of an acre of land available for micro-farms which can produce vast amounts of fruit and vegetables in that favorable growing climate. Beside the school and health center, we visited a community center where sewing machines have been set up to enable women who were formerly prostitutes to make a living for their families in the way they choose. Their teacher, Indiana, is a master seamstress who had sold her handicrafts to Rotarians who came to visit San Pablo shortly after the houses were constructed. On a return visit, a woman Rotarian was disappointed not to have more dresses to buy and asked if they might be prepared during the stay. Indiana said no, she was no longer sewing. Finally, when pressed, she admitted she had to sell her sewing machine for medical care for her daughter. For less than $100, the Rotarians secured another machine and her ability to make a living for her. When they returned a third time, she had plenty of dresses to sell and had purchased another machine for her daughter's use. Now, she teaches more ladies and campaigns among the visitors who admire the work for more cloth to make more cloths. I practiced my Spanish as we walked to her house to tell her with Americans my size visiting, she needed to have her women sew larger skirts than the well-made ones we bought there. 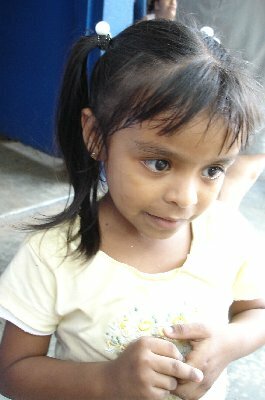 We returned to Managua full of ideas and concepts, changed by sights, smells, sounds, and people. For supper I ate one of the best steaks I've ever had at El Churrasco Restaurant. The next day, Sunday, served to break the tension and do some tourist-type activities. We traveled by bus to Masaya where a massive old building housed a delightful market. 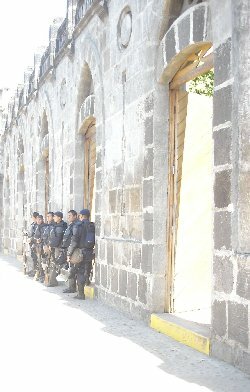 However, it was heavily guarded--even for Nicaragua. I learned as we were leaving the preparations were underway for a Sandinista rally that afternoon where Peter Noriega was selected as their candidate for president for the fifth time. We continued on to Granada, the oldest colonial town in the Americas where stately buildings are being restored and building restrictions have been imposed. There we ate lunch entertained by strolling musicians. The relaxation was at an end, though, for we changed to Land Rovers which should have been a clue about the road trip we were to take. 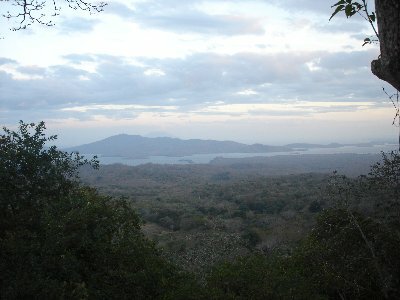 The distance from Granada to the Mombotour canopy adventure is said to be eight miles. It was the roughest imaginable 45 minute drive. Shocks in the Land Rovers last maybe four months; tires make it close to six sometimes. When we finally reached our destination we were decked out in the climbing gear. Tom Sheriff, Rotary District 5790 Governor, always thinking of ways to raise money for worthy projects, wanted to know how much I'd pay to keep my picture private. I grinned and told him I was going to post it myself. Little did I know at that time how much thinking and deciding it would take to put the picture up and tell the related story. Able to walk 10 minutes to the entrance of the tour. Strength and mobility to climb up a 50-inch wide ladder for 35 feet. Must fit safely in the harness as determined by the accompanying guide. Well, I flunked. I did okay swinging from tree to tree three times. It was the climbing of the ladder that started out difficult, especially after I reinjured a knee getting out of the Land Rover, becoming close to impossible by the top of the second ladder. Never one to give up, I had every intention of going on, remembering the wise advice of Bryan Bradbury that "Sometimes the best way out is through." 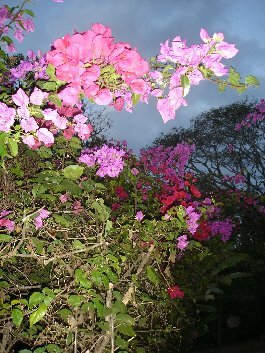 The Nicaraguans, however, thought differently, and they showed me how I was going to rappel down from the fourth tree. Mad? Yes. Embarrassed? Absolutely. While I don't watch the Survivor TV shows, the words "kicked off the island" rattled about my head as did "You're the weakest link." With the passage of time, I know the right decision was made. I will, however, redouble my efforts to lose weight and to climb the stairs to my 5th floor office daily (when that knee heals again) and one of these days I'm going to go back and fly through the air, yelling so loud the monkeys come to check me out. During the potential five hours of sleep the last night, a mild earthquake provided additional entertainment. Still, everybody was ready and the bus left at 6:00 a.m. It's good to be back in Texas, but Nicaragua's beauty, poverty, and people will stay in my heart forever.